This week has been dedicated to perfumes so far so I thought I'd share a perfume that is on my 'Perfume Wish List". I have long loved the sound of this perfume and adore the bottle it comes in. A few weeks ago I actually ventured into a Jo Malone store (for the first time) with my sister in law and she bought herself a bottle. Since smelling it for myself I have wanted it even more. The entire Peony & Blush Suede line is beautiful. The scent is described as being the essence of charm. 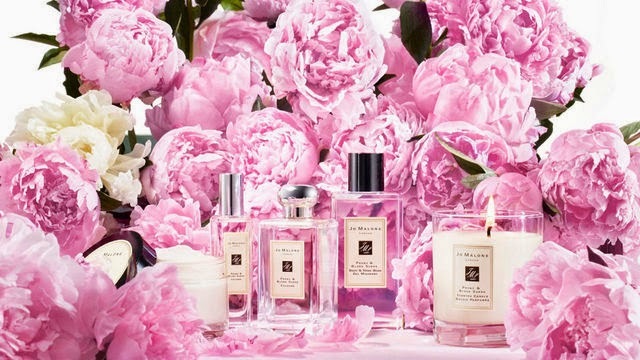 "Peonies in voluptuous bloom, exquisitely fragile. Flirtatious with the juicy bite of red apple and the opulence of jasmine, rose and gillyflower. Mingling with the sensuality of soft, blush suede. Luxurious and seductive." The perfume comes in a 30ml and 100ml bottle. If I recall correctly, a 100ml bottle costs R1250 which is steep, however when I compare it to other designer perfumes, where you pay around R700 - R1000 for a 50ml bottle, this perfume is actually reasonably priced.